Montreal come winter is full of charm and activity, be it via its myriad winter festivals, à propos sports, and outdoor activities. But if you're frozen before you even get to your attraction du jour because you just spent 20 minutes walking on icy sidewalks to get there? Kind of takes the wonderland out of winter, doesn't it. Or maybe you're in town on business and the last thing you want to do is deal with the cold, preferring to get from Point A to Point B with as little chill as possible. There's a solution for both of you. It's called Montreal winter hotels. Incidentally, you could also call them Montreal weatherproofed hotels. Or Montreal underground city hotels. These top Montreal winter accommodation picks are useful beyond the chilly months. They're ideal for anyone aversive to weather extremes regardless of season courtesy of their strategic locations. So if you love Montreal's summer joie de vivre but are concerned your trip might land smack in the middle of a hot and humid heat wave or worry a spring or fall time torrential rain might hit, then keep reading. This roundup is tailor-made for you. From Place Ville-Marie, you have access to Montreal's underground city and its plethora of shopping options and Metro stations, not to mention access to Scotia Bank Cinema, the city's most central movie theatre. You're also a short walk from the Redpath Museum and close to two subway stations. Get on at McGill Metro and exit at Place-des-Arts Metro on the Green Line if you want to check out Festival en Lumière, Nuit Blanche or a show at Place des Arts. Stay on the green line a bit longer until Berri-UQAM Metro and you'll make it to the Gay Village and the Latin Quarter. Stay on the Green Line a few station more until Pie-IX Metro and you'll be in the thick of the Olympic Park. Or hop on Bonaventure Metro on the Orange Line for convenient access to Chinatown or Old Montreal. Stay on a little longer and you'll make it to the heart of the Plateau. Freshly renovated since its grand reopening in July 2017, consider iconic downtown Montreal hotel Fairmount Queen Elizabeth for your next Montreal stay, its brand new contemporary interior evoking the city's golden years, located right across the street from Mary Queen of the World, Montreal's answer to Rome's St. Peter's Basilica. So apart from the obvious pluses, from being well-situated in the heart of downtown Montreal to its history as a guest favorite in the city, Queen Elizabeth made this list for one very simply reason: it's directly connected to Montreal's underground city and all of its shopping and entertainment conveniences. In other words, you could theoretically spend your entire sojourn in Montreal without stepping outside if staying at the Queen Elizabeth, especially if you come by train considering the central train station is but 2 to 3 minutes from the grand hospitality dame via the underground city. Looking for a kitchenette and a great location? Granted, you'll have to dash across Square Phillips and risk exposure to outrageously delicious maple products at the stand on its northwest corner or be faced with the city's best pizza on its east side to get to the closest underground city entrance, but said run is swift. Think 60 seconds at a slow, meandering pace. And if you can manage a short stroll east you'll also make it to Place des Festivals and Place des Arts, the heart of festival central in the city. Popular winter fests Montréal en Lumière and Nuit Blanche have their hubs there. Besides, guest raves speak for themselves. Le Square Phillips is one of the best hotels in Montreal, especially for families and small groups. On the hunt for a five-star hotel with impeccable service but a quick walk to the closest Metro station? Aren't we all. Try Le Sofitel in the Museum Quarter. In addition to its glorious proximity to the underground — because taxis can be such a hassle in a snowstorm — as well as a five-minute walk to the largest and most elegant museum in the city, the Montreal Museum of Fine Arts, Le Sofitel has the best room rate in Montreal relative to its five star accommodations. Traveling on a budget but still want to be in a decent downtown location, with a basic suite with kitchenette, and maybe free breakfast coupled with a heated indoor pool complete with sundeck because why not? L'Appartement Hôtel might be the way to go. If the weather is just too much, then make a beeline for the closest entrance to McGill Metro on the Green Line, which in the case of L'Appartement is less than five minutes away, one of the longer strolls listed on this Montreal winter hotels piece. The reason L'Appartement Hôtel still made the list in spite of its slightly lengthier walk is simple. It has a kitchenette and it's close to a supermarket — hint: there are almost no supermarkets downtown and the small stores which do exist here and there outside of Asian markets jack up prices — so you don't have to cough up extra cash for a cab ride or haul grocery bags on the subway, which cuts into fun time and your entertainment budget. Just walk about 3 minutes and boom. There's food. Lots of it. On sale. 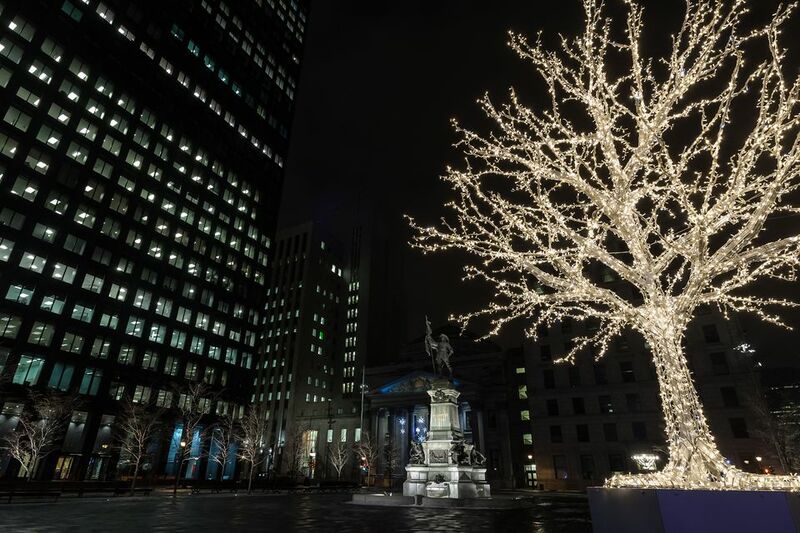 And if the weather is clement, you can walk to most central attractions, like to Place des Festivals where the bulk of Montréal en Lumière and Nuit Blanche's outdoor activities take place. Note that Old Montreal is further out this high up in downtown Montreal. Walking there in cold weather might not be the best plan. Use the Metro instead. With a very convenient location directly hooked up to Montreal's underground city and the central train station, if you're worried about getting caught in a blizzard and want the option of staying indoors, consider InterContinental Montreal. It's on the edge of both downtown Montreal and Old Montreal. Hop on Square-Victoria Metro on the Orange Line and get off at the next stop at Bonaventure Metro to access downtown Montreal's underground shopping network or go one stop in the other direction, Place d'Armes Metro, to get to Chinatown. You could also just step outside and walk a couple of minutes southeast to go on a walking tour of Old Montreal. It's actually easier in the winter to do just that from InterContinental. Walk there instead of using the Metro if Old Montreal is your destination. Its proximity to both Metro stations and Old Montreal at the same time is a huge deal, by the way. Old Montreal is crawling with fabulous accommodations but nearly every one of them is at least a 5-minute walk or further from the closest Metro station. And virtually none of those accommodations are near anything other than Old Montreal. That's not a problem in warmer months, but in the winter? It makes getting around inconvenient. Take it from someone who used to work in Old Montreal. Snow removal services in the neighborhood are the pits. And cobblestones hidden underneath all that snow don't help. Streets can get dangerously icy around steep descents and ascents like on Côte de la Place d'Armes, a road leading up to the Notre-Dame Basilica which you can bypass altogether if you walk there from Intercontinental. The one caveat with InterContinental? The rooms could use a refresh according to some, but otherwise, you can't lose. Hôtel Bonaventure's carpets and rooms could use an update, but who cares when that outdoor pool of theirs is GOLD. It's heated and open year-round. Swimming in a heated pool with that inevitably dreamy white mist rising above the surface as it always does in subzero temperatures... it's one of the best feelings in the world. Swimming surrounded by snow is so exotic and a way roomier experience than a hot tub. You can technically do laps if you want. The pool is big enough. It's like having access to a free Nordic spa with your stay, but better. And the location is fabulous, with Hôtel Bonaventure directly connected to the Montreal's underground city and all the shopping, subway and entertainment benefits that entails as well as situated literally across the street from the central train station. Sleek, styled and connected to Montreal's underground city, the W Montreal is right on the edge of Old Montreal's western side, offering a walkable experience of the old town, roughly ten minutes from the Old Port waterfront and attractions like archaeology museum Pointe-à-Callière and the Notre-Dame Basilica. And remember to grab a drink at the W's Wunderbar. The cocktails are fabulous. Is the weather abominable? No problem. Cross the street to Square-Victoria–OACI metro station and head to Bonaventure Metro one stop west, which brings you downtown. Walk toward and then through the central train station and Place Ville-Marie and voilà. You're in the thick of downtown Montreal's underground shopping network. You could theoretically leave your coat at home and stay indoors the whole day, even in a blizzard, though I wouldn't if I were you. Montreal weather is a funny beast and you never know when you might want to venture out if skies clear up. Any of these Montreal convention centre Palais des congrès hotel picks would fit the bill for avoiding the outdoors at all costs. Most are either directly connected to Montreal's underground city or are a quick block away to the closest entrance. Easily one of the top two most luxurious hotels in Montreal, Le Saint-James is one of those rare Old Montreal accommodation gems that links up to Montreal's underground city. Impeccable service, fine dining and a stylish room at this boutique hotel is a guarantee. And try not to act surprised if you see a celeb in passing. They're always staying here. Find accommodation value in Old Montreal with the InterContinental Montreal.